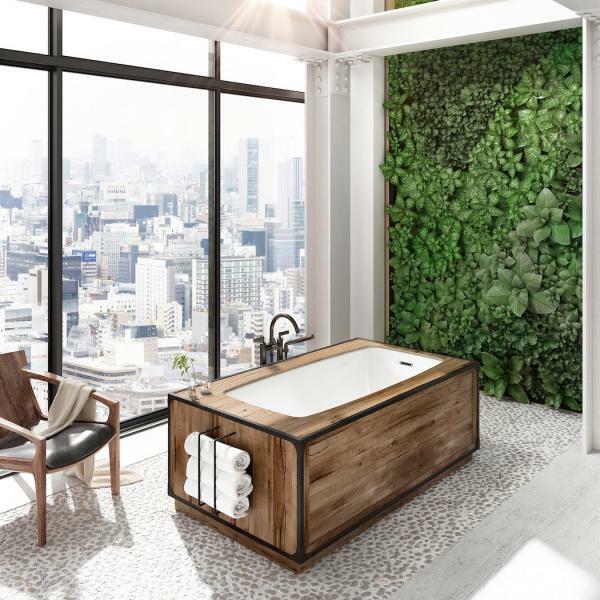 BainUltra’s contemporary new Vibe tub offers a freestanding solution for small, urban spaces. The simple, ergonomic design, inspired by city skylines and architecture, features sloped walls and a smooth exterior silhouette. At 58 inches long, it’s small footprint is suitable for condos and city homes with limited space. BainUltra says Vibe is intended to “appeal to a new generation of bathers, especially up-and-coming millennials who value the benefits of a nice long soak at the end of a hectic day.” It’s equipped with a variety of hydro-therapies, including the company’s Hydro-Thermo Massage feature and Illuzio chromatherapy. The freestanding version, measuring 58 inches by 28 inches by 21 inches, is available in glossy white, Ultravelour matte, or a black-and-white finish. Vibe is also available as a drop-in with an undermount option or an alcove model, both available in a glossy white finish and measuring 60 inches by 30 inches by 19 inches.